"Every year 18 of us get together for our annual 'Heart Party' in honor of Valentine's Day. Besides sharing a favorite craft, we bring 18 cookies and share a favorite recipe. This was mine from last year. The recipe is written using white chocolate, but you can use dark chocolate instead, or use half white and half dark. I like to decorate mine with candy sprinkles too." Soak craft sticks for one hour in a bowl of cold water. In large bowl with electric mixer at medium speed, beat butter, brown sugar and vanilla until fluffy. Beat egg in well; beat in cooled chocolate. With mixer at low speed, beat in flour, cocoa powder and salt until smooth. Divide dough in half. Roll each half out to 1/8 inch thickness between 2 sheets of wax paper; freeze, in wax paper, 5 minutes. Peal top sheets of wax paper off dough; cut dough out using 3-inch heart-shaped cutter. Reroll scraps; freeze again 5 minutes; cut out. Place half of the hearts 1 inch apart on prepared cookie sheet. To Make Icing: In large bowl with electric mixer at high speed, beat egg white and confectioners' sugar until very smooth. If desired, remove small portion of icing to separate bowl; tint with drops of food coloring. Spoon icing into decorating bag fitted with small writing tip; pipe over lollipops in desired patterns. 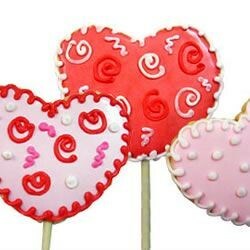 Decorate with assorted candies and decors; attaching with dots of icing. this was an ok recipe. it was the hardest cookie i have ever made. they took me 3 days to make and the recipe was miss leading on how easy they were.